Visiting college and university campuses across the nation is a unique and invigorating experience. Even though the primary roles of educational institutions may be advancing the education of students and research, it seems that no two campuses are the same. Some campuses may have one million square feet or less of building space, and other campuses may have tens of millions of square feet. Some campuses may be old and others new; some may be urban and others rural; some may cover massive acreage of land and others may be crammed in between existing city buildings. Regardless of the differences, some measures come to mind that can impact a visitor's perception of any campus. First impressions are lasting impressions, and when one walks on the campus for the first time, the appearance of the grounds and the buildings will have an immediate impact upon the visitor, the student prospect visiting the campus, or the student's bill-paying parents. A growing body of research clearly indicates that the appearance of the grounds and the cleanliness of buildings have a direct impact on student recruitment and retention at institutions of higher education (David Cain, Ph.D., and Gary L. Reynolds, P. E., "The Impact of Facilities on Recruitment and Retention of Students," APPA Facilities Management Article–Part One, and APPA Facilities Management Article–Part Two, 2006). An institution that wishes to attract the best and brightest students and researchers needs to attend to these details and maintain the optimal level of appearance. Several research projects commissioned by APPA have highlighted and clearly documented the importance of the appearance of grounds, and the appearance and cleanliness of buildings on students. A recent study by Jeffrey L. Campbell, Ph.D., and Alan S. Bigger, M.A., Cleanliness & Learning in Higher Education (APPA, 2008), emphasized the correlation of students' perception of the impact of cleanliness on the learning environment. In addition to research conducted about the visible impact of cleaning on a campus, Dr. Charles P. Gerba of the University of Arizona has conducted some solid research. A growing body of research demonstrates a correlation between clean facilities and lower absenteeism in institutions, as exemplified by Dr. Gerba's study, Cleaning Desktops and Other Classroom Surfaces Reduces Absenteeism, which chronicled a 50 percent absenteeism reduction when certain measurable cleaning processes were practiced. Viruses that cause influenza, diarrhea, and respiratory illness commonly occur on school-age children's desktops and other surfaces in educational facilities. Every time these surfaces are touched, viruses can be transmitted to healthy individuals. Office buildings are not exempt. During the cold season, Dr. Gerba's group found cold viruses on surfaces in a third of offices across the country. Thus, not only does cleaning complement a student's ability to learn, it can also contribute to a student's overall health. One of the most significant contributions of Dr. Gerba's research is that it documents the existence of a clear relationship between cleaning and health. As the body of research demonstrating the importance of custodial operations at institutions grows, there is increasing competition among institutions to attract the best, and parents and students are expecting the best at an affordable price. The students of today are savvy consumers as they select the institution they wish to attend. When students visit campuses on recruitment tours, they are looking closely at not only the academic offerings of an institution, but also the types of resources that the mix of buildings offers on campus, and their evaluation of these buildings could be significantly impacted by the cleanliness, or lack of cleanliness, of the buildings. Keeping buildings clean is an important element in bringing students to our campuses, and retaining them once they are there. However, even though there is mounting empirical evidence that the appearance of the grounds and buildings and the cleanliness of the buildings is important in recruiting and retaining students, there is an increasing and seemingly insatiable desire for these operations to become more efficient and less costly, without these measures having a significant impact on the level or quality of services provided. APPA's Operational Guidelines for Educational Facilities - Custodial, 3rd edition (2011) documents quite clearly that there is a law of diminishing returns. We may seek to decrease operational overheads and clean more space with fewer custodians, yet as we do so, and as cleaning is done less frequently, appearances will suffer. In this environment, it is critical that managers understand the important role of custodial operations, and that there is a clear and inseparable relationship between custodial services and the academic mission of our institutions. One of the greatest challenges that a custodial manager faces is communicating the mission and purpose of custodial services to the administrative hierarchy. It is important that the mission of the custodial services be linked with the mission of the institution. The primary mission of custodial services is to provide a clean environment that supports and adds value to the educational mission of a campus. The custodial operation brings value to the setting of the institution by enhancing the appearance of the buildings and presenting an acceptable level of cleanliness that is supportive of and synergistic with the learning mission of the institution and its impact on student recruitment and retention. The policies, procedures, and programs that custodial services implements will support that mission. Traveling from one city to another, drivers need a map or global positioning system to guide them from point A to point B. Getting to the destination does not just happen—it needs to be planned. When a driver leaves point A and does not have any idea how to get to point B, the chances of being successful and getting to that destination efficiently are severely diminished. Flying or driving by "the seat of the pants" is not efficient, cost-effective, or time-effective. Likewise, custodial services need a clear road map to guide the operation in an efficient and cost-effective manner. We need to take an inventory or an audit of where the organization was in previous years and where it is today, and forecast where it is going tomorrow. The use of longitudinal data is a highly effective tool to assist us as we head into the future. • Floors and base moldings shine and/or are bright and clean; colors are fresh. There is no buildup in corners or along walls. • All vertical and horizontal surfaces have a freshly cleaned or polished appearance and have no accumulation of dust, dirt, marks, streaks, smudges, or fingerprints. Lights all work and fixtures are clean. • Washroom and shower fixtures and tile gleam, and are odor-free. Supplies are adequate. • Trash containers and pencil sharpeners hold only daily waste, are clean and odor-free. • Floors and base moldings shine and/or are bright and clean. There is no buildup in corners or along walls, but there can be up to two days worth of dust, dirt, stains, or streaks. • All vertical and horizontal surfaces are clean, but marks, dust, smudges, and fingerprints are noticeable upon close observation. Lights all work and fixtures are clean. • Floors are swept or vacuumed clean, but upon close observation there can be stains. A buildup of dirt and/or floor finish in corners and along walls can be seen. • There are dull spots and/or matted carpet in walking lanes. There are streaks or splashes on base molding. • All vertical and horizontal surfaces have obvious dust, dirt, marks, smudges, and fingerprints. Lamps all work and fixtures are clean. • Floors are swept or vacuumed clean, but are dull, dingy, and stained. There is an obvious buildup of dirt and/or floor finish in corners and along walls. • There is a dull path and/or obviously matted carpet in the walking lanes. Base molding is dull and dingy with streaks or splashes. • All vertical and horizontal surfaces have conspicuous dust, dirt, smudges, fingerprints, and marks. • Lamp fixtures are dirty and some (up to 5 percent) lamps are burned out. • Trash containers and pencil sharpeners have old trash and shavings. They are stained and marked. • Trash containers smell sour. • Floors and carpets are dull, dirty, dingy, scuffed, and/or matted. There is a conspicuous buildup of old dirt and/or floor finish in corners and along walls. Base molding is dirty, stained, and streaked. Gum, stains, dirt, dust balls, and trash are broadcast. • All vertical and horizontal surfaces have major accumulations of dust, dirt, smudges, and fingerprints, all of which will be difficult to remove. Lack of attention is obvious. • Light fixtures are dirty with dust balls and flies. Many lamps (more than 5 percent) are burned out. • Trash containers and pencil sharpeners overflow. They are stained and marked. Trash containers smell sour. A building inventory of how many buildings have been maintained over the years and the cleanable square feet of the buildings. The gross square feet method provides only a thumbnail sketch; the cleanable square feet method is much more effective, as there are many areas and spaces in a building that a custodial staff may not clean. A staffing inventory of the staff that has been used to clean these buildings over the years that are being audited. The categories or types of spaces maintained, such as classrooms, offices, and public areas. The square feet cleaned per custodian during those years. The cost per square foot to maintain these spaces, with labor costs per square foot and supplies cost per square foot. The level of appearance or quality of service provided during the years. In 1992, APPA published the first edition of the Custodial Staffing Guidelines, in which the levels of appearance were originally established and defined. Originally, the guidelines defined 10 room types. APPA's current guidelines provide for 33 room types; the ideal would be to correlate spaces as closely as possible to those room types. The 33 room types, productivity associated with each room type, and service level are displayed in Figure 2. An audit should document, albeit retroactively, the level of service provided over the years. APPA's guidelines provide a weighting system that can be used during the audit process, as not all areas or spaces may have equivalent weight. Conducting this audit will help establish a baseline for operations and document activities that have taken place over the years. The audit will provide the total square feet cleaned, the number of full-time equivalent (FTE) employees that it takes to clean the space, the average square feet maintained by each FTE employee, the cost per square foot for labor and supplies, and the APPA level of appearance that has been provided by these services. One can take these data in summary form to indicate to the administration the effectiveness of the organization. Once the audit has been completed, there will be a clearer understanding of the organization's performance history, and it will be easier to start considering what direction the department needs to move in the future. How is the organization really doing? Is the organization more or less effective and efficient than comparable institutions? APPA's most current edition of the Facilities Performance Indicator (FPI). This survey is updated yearly, and institutions can participate in the survey by plugging in its data and then comparing themselves with like or unlike institutions. For more information, visit www.appa.org. APPA's appearance levels and anticipated productivity associated with each room type and appearance level, as displayed in Table 32.1. Organizations can be compared using this information as a baseline. The International Sanitary Supply Association at www.issa.org provides useful benchmarking data. The International Executive Housekeepers Association at www.ieha.org provides information. Several software packages are available to help with data collection and the benchmarking process, such as that provided by APPA's new software package at www.appa.org. The custodial operation is very labor-intensive, and work must be accomplished with and through people. As a rule of thumb, excluding benefits, approximately 90 percent of custodial costs are in labor and 10 percent in cleaning supplies. So the effective management of the custodial staff is vitally important. At this stage, it is useful to know the elements that go into the custodial equation that impact the cost of operations. The task to be performed, such as dusting furniture, mopping floors, or vacuuming carpets. The frequency with which the task is going to be performed, for instance, daily, alternate days, weekly, biweekly, or monthly. The time allocated to complete the work to be performed. No matter how efficient the performance of a task may be, the task takes time. The type(s) of space to be cleaned. There are significant differences between hallways and restrooms, classrooms and research laboratories. The level of appearance expected. APPA's five levels of appearance seek to define levels of clean. The types of equipment that are used. For instance, if a custodian mops a floor with a standard or microfiber mop, it will take significantly more time than if the area is cleaned with automated equipment such as an autoscrubber. 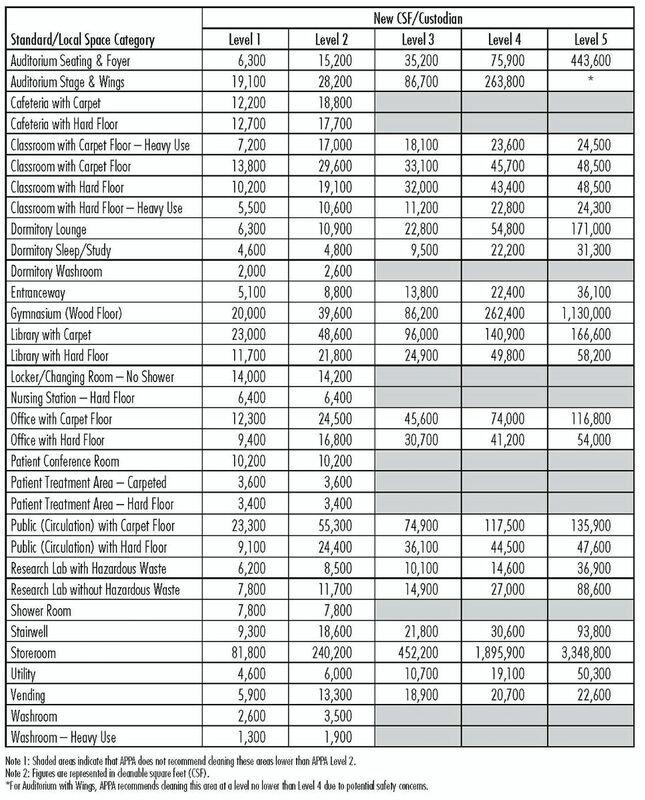 The amount and cost of materials necessary to accomplish the task(s). The hourly cost of labor for time expended to complete the task(s). Variables such as climate and geographic location, age and complexity of facilities, training programs, types of space and usage of that space, age of facility, hours of usage, and traffic density. The models of staffing may vary from institution to institution. For instance, one institution may use a zone cleaning method, whereby one custodian is assigned to clean a certain area, such as two floors of a building, day after day. That zone is the person's responsibility to clean each and every day. Another institution may opt for a crew or gang cleaning concept, whereby a crew goes into a building, with perhaps four people cleaning eight floors. They work together to accomplish the tasks, literally sweeping through the building from top to bottom. These groups may also be defined and trained as self-directed work teams, with each team member holding the whole team accountable. The use of team cleaning is a more refined step, where assigned specialists flow through spaces to be cleaned. One may perform all the dusting, another vacuuming, another taking out the trash, and another may specialize in restroom cleaning. Team cleaning is becoming increasingly popular as people become specialists at their task assignments; ultimately, all team members can be cross-trained to perform all functions. One method may not work in all areas, and a hybrid of staffing methods may be required. However, the systems that seem to work best are those that build the self-worth of the custodians, that make them feel supported and empowered to have a say in how work is going to be performed, and that provide the custodians with a sense of accomplishment at the end of each day. Raw-square-footage method. Simply take the total number of square feet (e.g., 100,000 square feet) and divide by an expected productivity standard, such as 25,000 square feet per custodian, per day. The resulting staffing needed is four custodians. However, this does not take into consideration the complexities of the space, nor does it establish the acceptable level of appearance after the cleaning process has been completed. Fixture method. Some staffing systems are based upon a complete inventory of every fixture in a building and how long it takes to clean each fixture based on industry standards. Even though highly detailed and scientific, this system does not identify the acceptable level of appearance after the work has been performed. The good news for managers is that various computer modeling programs are available to assist in computing staffing assessments and projections for an institution. When is the right time to clean? Increasingly, university buildings are becoming 24-hour operations, seven days a week. However, in most cases, the funding available to the custodial manager may enable a facility to be cleaned only on one eight-hour shift, or at most two shifts. Funding may only be available for five days a week, or the manager may have to stagger staffing to cover weekends or holidays. In most cases, institutions are expected to provide maximum cleaning while using minimal staff. Day cleaning. Day cleaning is becoming increasingly popular, as it minimizes the use of excessive energy since heating and air conditioning systems are on (no need to heat or air condition at midnight when there are only a few people in a building); lighting needs are minimal; most people perform better and feel more valued if working when they are visible; the customers tend to be more satisfied if they see the custodian and can have items corrected immediately; also, day work tends to be more family friendly. It provides employees a degree of self-management of their time and performance, as they are constantly observed by customers. Potential downsides of day cleaning are that it is harder to clean spaces that are occupied or when the cleaning process is disruptive. Work gets missed if occupied rooms are not revisited to be cleaned later. Customers may find that cleaning during the day interferes with business operations if cleaning equipment is noisy or dusting is disruptive to an office's workflow. Late-night cleaning. Generally the buildings have less traffic and there is a greater ability to clean larger areas with less disruption. The downsides are many, such as that the building systems have to be fully functional; increased management attention has to be provided as humans, in general, are not wired to perform during hours of darkness, even though some people do enjoy night work. Custodians are not visible to many customers, so customers may assume that if the custodian is not visible, the work is not being performed. Also, night work tends to interfere with the life cycles of homes and families. Swing-shift cleaning. This shift affords the custodial staff that works in the later afternoon and evening an opportunity to interface with customers before they leave for the day, clean offices after people leave, and in most cases clean classrooms and common areas with limited disruption. However, this shift is constantly being squeezed with longer hours of operations for buildings and increased student and researcher presence in buildings. The shift does tend to split the day and night for employees; some like this, yet others find it to be disruptive to their lifestyles. Which shift staffing works the best? That must be determined in conjunction with the customers and employees to ensure that shifts are optimized to meet institutional and stakeholder needs. Far too often, cleaning has been assumed to “just happen.” Hire employees, provide them with basic equipment and supplies and a checklist of what to do, and send them out to clean a building. It is becoming increasingly evident that if institutions want clean facilities, custodians and their managers must have a thorough working knowledge of the cleaning process. What are the key elements of the cleaning process, the bricks and mortar that hold a custodial operation together and ensure that the custodial organization is operating effectively and efficiently in a cost-effective manner? A clear vision of the role of cleaning in the operation of a custodial services and the educational mission of the institution. The custodial staff plays a critical role in the educational mission. By keeping the facilities clean, the custodians contribute to student recruitment and retention, the health of the community, and the creation of an environment in which the university stakeholders can work, study, and play. Detailed policies and procedures for the cleaning operation. A sign in a hospital conference room stated, “If it isn't documented, it didn't happen!” The same is true for custodial operations. If policies and procedures are not clearly described, it is unreasonable to expect correct performance, proper behaviors, or efficient operations to automatically be the outcome. Clear job expectations. Clear and precise job descriptions must be developed, so the custodians know expectations. Precise job assignments. The custodians should have precise job assignments that describe place and timing, so they know the tasks that must be performed each day. Measurable standards. Custodians should be provided definitions of cleanliness for each given task. APPA's five levels of appearance are a good starting point. The standards should be observable, measurable, consistent, and realistic. The manager should clearly explain these standards. The use of chemicals. The use of all chemicals should be explained, along with the role of Safety Data Sheets (SDS), personal protective equipment (PPE), and Occupational Safety and Health Administration (OSHA) and Environmental Protection Agency (EPA) rules and regulations. Custodians need to know that chemicals do not automatically work. 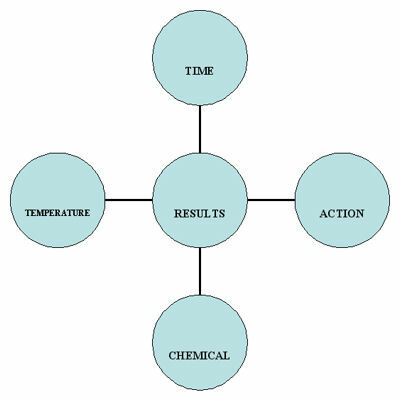 Four key elements have to interact to enable chemicals to perform properly: time, action, chemical, and temperature (TACT). These elements are listed below and displayed in Figure 3. Time: All chemicals take time to work effectively, and this is especially true for disinfectants. The industry calls this "dwell time." Action: Just splashing a chemical on a surface does not release the soil. Action is necessary, such as the action provided when wiping a surface with a microfiber cloth. Chemical: Chemicals need to be mixed properly and in accordance with the manufacturer's directions. Manufacturers provide clear directions about the dilution ratio of chemicals, such as half an ounce of chemical to a gallon of water, expressed as a ratio of 1:256. If mixed properly, the chemical will perform to expectations. However, if chemicals are not mixed properly, surfaces can be damaged, chemicals wasted, and the health of employees can be adversely affected through overexposure to the chemicals and odors caused by the chemicals, as well as exposure to the possibility of chemical burns or severe allergic reactions. Chemicals that are mixed improperly can leave films on surfaces and make surfaces sticky, and will not necessarily remove dirt. Different chemicals should never be mixed together, and all chemical containers and secondary containers need to be properly labeled to meet or exceed OSHA requirements. Temperature: Even though more chemicals are being developed to perform effectively in cold water, custodians should read manufacturers' directions, as some chemicals perform better at certain temperatures. The use of equipment. The right equipment used the right way will facilitate the right results. The reverse is true as well. The wrong equipment used the wrong way will produce the wrong results. It is important that custodians be trained to use the correct equipment safely and properly for any given task. Too often floors are damaged by operators using pads that are too abrasive, or walls are damaged because the operators of buffers or autoscrubbers are not properly trained in their use and lose control of the equipment, or operate equipment in a less-than-careful manner. Proper training. It is imperative that proper training be provided by qualified trainers for custodial staff, from the first day on the job and continuing throughout their career. Training must be ongoing, innovative, invigorating, inviting, and lead to ongoing improvement so that the custodial operation is on the cutting edge of evolving methods, procedures, and practices. There should be initial in-depth training programs for custodians, subsequent training in the field after the initial training, and refresher training to keep the custodial staff up-to-date on current processes. Training gets cut too often when budgets are tight. It is during tight economic times, when institutions expect more from staff, that they must invest time in training, so staff can meet the increasing demands of their positions. An active safety program. Custodial work is incredibly labor-intensive, and the proactive manager will ensure that active and participatory safety training is in place. Soliciting input from the people who perform the work is vital in the effort to minimize injuries. Safety training should be provided on all equipment, supplies, and processes. When an injury occurs, there should be a thorough review of the incident to reduce the risk of such an incident reoccurring. The use of a safety committee that consists of managers and employees who interact and investigate injuries together, without violating confidentiality, can be effective in decreasing injuries. There is no doubt that custodial services is continually challenged to do more with less and to provide a consistent level of cleaning and service while containing costs. Thus, it is essential to implement an effective quality assurance program that will lead to continuous improvement. What are the elements of such a program in a custodial services operation? The communication of clear standards mentioned earlier. A basic quality assurance process where custodial managers visit job sites and evaluate the quality of work performed by the custodian, ideally with the custodian present so that expectations can be clarified immediately. Some supervisors may use a pen-and-paper inspection form; however, wireless personal digital assistants are increasingly being used to document this process. The data can then be downloaded to computers and used for feedback, tracking, and comparison purposes. A visit to areas cleaned and a discussion with the customer as to what he or she sees. This is a vital step as it enables the manager to see the cleaning process through the eyes of the customer. It also provides a rich opportunity for the manager and customer to interact to clarify expectations. A series of random surveys to gather information from customers. A review of all compliments or complaints that have been received. These should be logged in by the office as they are received. A comparison of the inspections performed by the manager with the survey information provided by the customer reviewed against the compliment and complaint log. By comparing these elements, the manager will be able to develop a clearer perspective of the cleaning process, the effectiveness of the process, and an action plan that will enrich and enhance the performance of individual custodians. An opportunity to praise is provided by this process as stellar performers are identified or improvements made. An opportunity to promote improved cleaning and processes is provided by this comparison as areas of growth are identified. Opportunities for additional individual or group training may be developed as areas of weakness are identified. An opportunity for team building is provided as the manager works with the custodial team to identify the strengths of the organization, the weaknesses of the organization, the opportunities for the organization to grow and excel, and the potential threats to the organization (problems, deficiencies, etc. ), and to develop an action plan that will lead to the continuous improvement of the operation. Custodial services has a direct impact on the environment of the buildings and the surroundings in which cleaning is performed. The custodian can make active contributions to indoor air quality by keeping areas clean and free of soils and bio-pathogens. The release of volatile organic compounds can be minimized by using chemicals correctly. Recycling commodities generated in buildings reduces the amount of solid waste that goes into local landfills. Use of environmentally friendly products and processes. A growing list of products have received the seal of approval by organizations such as Green Seal. Use of products certified by this organization minimizes the environmental impact compared with products without this certification. New vacuum cleaners and other cleaning equipment can decrease the impact on indoor air quality and the environment. Innovative manufacturers are developing cleaning equipment that minimizes the large-scale use of cleaning chemicals and compounds. The advent of microfiber cloths and mops has greatly increased the effectiveness of the cleaning process without the use of harsh chemicals. Recycling. Recycling, in a sense, starts before a product is even purchased. Purchase products that have the least environmental impact and in quantities that will minimize discarded waste product. Strive to buy products in packaging that can be reused or recycled, like cardboard or recyclable plastics such as HDPE I and II, or on pallets made out of cardboard, wood, or plastic that can be either recycled or returned to the supplier for reuse. If the purchase of products that cannot be recycled is avoided, those products will not be discarded in landfills at the end of the day. Indoor air quality. By purchasing chemicals with low volatile organic compounds, custodial services will not degrade a building's indoor air quality. By using vacuum cleaners eqiped with high efficiency particulate air filters (HEPA filters) that minimize the distribution of dust particulates into the area, indoor air quality will actually be improved as dirt and dust is removed from buildings. Benchmarking. There will be an increasing need for organizations to benchmark with other peers and institutions, for comparison as well as growth purposes. This has been mentioned earlier, but benchmarking is here to stay, and organizations need to measure and compare to continuously improve. Benchmarking should include peer institutions as well as dissimilar organizations, so the custodial manager can become knowledgeable of the best practices that could be implemented in his or her operation. Measure of cleaning. Technology has been developed that will enable mangers to measure the effectiveness of cleaning programs. APPA’s custodial guidelines and levels of appearance were a quantum leap in an industry that up through the late 1980s demonstrated little interest in any form of industrial quality measurement in the field of custodial operations, especially as it related to appearance levels or levels of cleanliness. As we move to the future, new measurement technologies are available, such as the adenosine triphosphate (ATP) meter (see Figure 5). This meter identifies ATP on a surface. According to Robert W. Powitz, Ph.D, MPH, “ATP is the primary energy transfer molecule present in all living biological cells on earth—its measurement is a direct indication of biological activity. Simply stated: no biological contamination, no microbial growth.” The advantage of the ATP meter over the traditional method of colony counts is that it provides data in real time (i.e., seconds instead of days) and at a low cost. This provides for immediate feedback and allows for quick corrective action as needed. 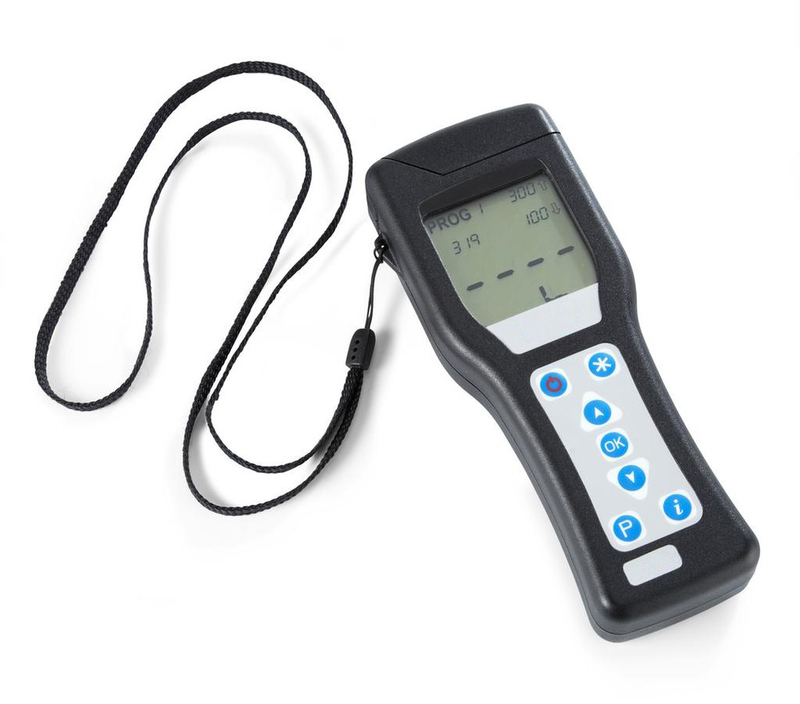 Other measurement instruments are currently being used, such as handheld air-monitoring equipment, water quality monitoring meters, ultraviolet-revealing technology, and volatile organic compound measuring units. A more scientifically-based cleaning process. The custodial services manager will need to stay current with the research, such as research conducted by Drs. Gerba and Powitz mentioned earlier. A good starting point for custodial research is APPA; The Cleaning Industry Research Institute (CIRI), which was founded “to raise awareness of the importance of cleaning through scientific research”; or the International Sanitary Supply Association. Professional development. The custodial services manager of today needs to be a true professional and needs the skill sets to be successful in today’s environment. Involvement in the professional development process afforded by APPA is the ideal solution. APPA provides a professional development continuum of programs that will enhance a manager’s skills through programs such as the Supervisor’s Toolkit and the Institute for Facilities Management. Such training can pave the road for the custodial manager to earn an Educational Facilities Professional Credential or become a Certified Educational Facilities Professional (APPA Certification). During the past few years, managers have been exposed to training that indicates the need to understand the generational differences that impact the workplace. Such training has provided labels and statements that have been attached to describe and to facilitate understanding of generational differences in an organization. One of the drivers for a recent generation has been the question “What is in it for me?” This driver is also embedded in the culture of many organizations that ask “What is in it for the organization?” or in the case of custodial services, “What does custodial services bring to the table that benefits the organization?” Custodial services provides innumerable benefits to an institution that are worth repeating, not only to the reader but also to the administration of the institutions. What are some of the value-added benefits that custodial services provides? A clean environment that is aesthetically appealing that contributes to the learning process. A healthy environment that contributes to the health of individuals and the institution. A safe and secure environment—custodians are an extra set of eyes and ears for the institution and provide an additional level of security to the campus community. An ambassador for all—custodians are spread throughout the campus and can be ambassadors of goodwill to students, visitors, faculty, and staff who otherwise may not have contact with university personnel. An environmental legacy—custodians remove trash, recycle products, remove dirt from buildings, and use environmentally friendly chemicals to improve indoor air quality and provide cleaning services for a healthy environment in campus buildings. Implementing the processes outlined in this chapter may seem to be practical and reasonable. However, we all live and operate in a world that seems to have ever-increasing expectations for expanding levels of services while either holding costs in line or decreasing the costs of the services. In other words, more service for less, or using APPA’s custodial staffing terminology, providing Level 1 service, “orderly spotlessness,” which is an expensive proposition, while operating with the equivalent of Level 4 or 5 funding. How do we bridge the gap between what customers expect and what we can honestly deliver during times of severe financial constraints? There is no doubt that we will never have all the monetary resources to please all customers, all of the time. The key issue is to involve all stakeholders at all levels in an honest discussion of the resources available to the custodial operation and what that level of funding will mean to the customer in the delivery of services. The APPA Staffing Service Level chart clearly indicates that the people who perform and deliver the cleaning services have production constraints, they can only work so fast, and the types of tasks and how often they perform those tasks are limited by the amount of space they must clean and the amount of time in a day. This is where the beauty of the APPA custodial staffing approach comes into play. By clearly documenting the appropriate information, on one page, the facilities manager can indicate how much it will cost to provide Level 1 to Level 5 service, and what this will mean to the stakeholders in delivery of services. A real example may help to illustrate this point. A university was experiencing some budgetary restrictions and the financial officers of the institution were trying to figure out how to cut costs within the facilities management budget. One of the departments that came under the microscope was the custodial services department. With a budget in the millions, the administrators thought this was a good area to review! The facilities managers conducted a review of the custodial operations and used the guidelines provided by APPA. On one side of a single piece of paper they were able to clearly demonstrate what would happen if the custodial budget were cut, the impact on the number of employees, and the levels of cleanliness that would be provided. The discussion included how many custodians would be needed for Levels 1 through 5, the cost associated with each level, and descriptions of the appearance levels at each level of staffing. The university’s budget personnel and administrators quickly comprehended the impact of making cuts in the custodial budget. However, the cuts had to be made, and the discussion moved toward how to implement the cuts and the potential impact. After discussions, the decision was made to change cleaning of offices from daily cleaning to alternate-day cleaning. That simple change provided adequate savings and had a limited impact on employees as it was decided to modify staffing as employees retired or left the institution. The administrators and the budget office were very complimentary of the approach, thanks to APPA! During those discussions it was also decided that the cuts in service would start immediately in the offices of the president, provost, and all senior administrators and that the adjustment in service levels would be gradually implemented across campus so as to enable the attrition of personnel to occur with limited hardship on individuals. The facilities manager drafted a letter to all campus personnel that was signed by senior university officials, and copies of the letters were hand carried to all office areas that were impacted by the levels of service. The budget issues were clearly explained, and the impact of those restrictions on the levels of service was communicated to all stakeholders. During this entire process, facilities management staff met with the custodial staff to keep them advised of the pending changes, the need for the changes, and the impact on their work schedules and long-term employment. Once the message was communicated to the entire campus, facilities managers and supervisors met with individual departments and offices to streamline the service. Service-level charts were made available to all stakeholders clearly indicating what cleaning tasks would be performed and how often. Not everyone agreed with the changes, but they understood the reasons for them and supported the mission of the custodial staff. As expectations for levels of services increase and the funding for the services stays the same or decreases, it is imperative that facilities managers spend time and effort to clearly communicate the impact of fiscal decisions to all stakeholders. The discussions should include all levels, from custodian to custodial supervisor, from facilities managers to senior university officials, and from senior officials of the campus at large so that all clearly understand the rationale behind changes. Obtaining “buy-in” across campus will enrich the relationships between all stakeholders. The managers of custodial services are faced with increasing challenges to do more with less, and to provide equivalent or better service levels to institutions when funding for such services is decreasing. They must be creative and flexible to provide levels of services that meet or exceed the stakeholders’ needs across campus. To do this, the custodial services manager must be a facilities professional who is on top of his or her game professionally and on the cutting edge of evolving technology and innovations. By so doing, the custodial services manager will be able to manage a lean, green, cleaning machine that provides effective and efficient services in a manner that is environmentally sustainable for the future.